We in the yoga community are becoming increasingly aware of the need to strength train and vary our movement. Complementary training is vital to the longevity of a yoga practice, and strength training can often help us work on imbalances created or perpetuated by repetitive movements and lack of movement diversity, both within and outside of yoga. While it is true that many yoga classes include strength work, practicing vinyasa yoga (for example) for years at a time strengthens certain parts of our bodies, while neglecting others. No one form of movement does it all. After teaching for over a decade, I’ve noticed that repetitive strain injuries and hypermobility are on the rise, alongside an imbalance between stretching and strength training. We may understand that our bodies are designed to do many types of movements, but where do we begin? And how can we make sure we are entering the world of strength training in a safe and mindful way? 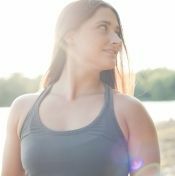 I’ve dedicated the last five years to educating yogis about mindful strength training, and there are a couple of valuable considerations we don’t always keep in mind when we begin a new regimen. We need guidance on how to begin. And in order to get off on the right foot, we need to think about the building blocks of mobility, strength, and joint preparation. With yoga as well as other forms of movement, we are accustomed to watching the body move from the outside, but we need to think more about how it moves from the inside. When we perform a simple movement, such as lifting our arms overhead, the muscles, fascia, and other tissues under the skin and all through our limbs are moving differentially—while at the same time they move together to perform the movement. If our tissues are bound up on the inside, focusing on our external movements will feel frustrating. If bringing the arms overhead into flexion is difficult, that doesn’t mean we just have to keep trying harder to bring our arms overhead; mobilizing the tissues around the shoulders and core is essential. For instance, we can mobilize the shoulders in a variety of ways—with activated shoulder circles, hanging from a bar, self-massage, and even visualization. Being able to move and feel the different parts of the body is essential, as is finding different ways to work with our tissues. I will also add that when muscles feel bound up or tight, the restriction is oftentimes coming from the nervous system, and techniques like rolling on a ball or hanging from a bar can help us get things moving better. When we have a lack of strength, the body can lock things down in an attempt to stabilize itself, leading to the feeling of being stiff or tight. This is why I don’t only recommend stretching for increasing range. Being able to move and feel the different parts of the body is essential, as is finding different ways to work with our tissues. On the flip side, if we have tons of flexibility or range of motion in our bodies, we have to make sure we are stabilizing ourselves enough, especially when working with weights and load. Let’s say that someone has no trouble bringing their arms overhead, and they know how important pulling is, so they go ahead and hang from a bar. If the tissues in the limbs and trunk aren’t ready to support the weight of the body, some people can injure themselves—even from a movement as “functional” as a simple bar hang. My first tip for a yogi who is starting to strength train is to notice how your body feels during movement, and act accordingly—without pushing past the limits. You want to work in the ranges where you have control, and work to develop more control and awareness during movements. We can’t assume that our bodies are ready to take on large loads in untrained positions all at once, especially if we are coming into the practice with a very flexible body. It’s also important to remember that our body weight itself is a relatively large load! Start small; hang from the bar, but maybe keep your feet on the floor. If strength training is new for you, the first phase of practice will work primarily on the nervous system. When we begin practicing a new exercise, we are first changing the way the muscles and tissues contract, relax, and move our bodies. As beginners, we improve quickly, but not because we are initially packing on more muscle. We feel stronger almost instantly because our bodies become more efficient at recruiting and moving certain parts, and at doing the actual exercise. This is essential to remember when we begin new methods of training. Because we start to feel stronger within just a couple of days, we can easily do too much and overload our tissues past what they can comfortably manage. As we continue to strength train over weeks and months, our tissues begin to remodel, leading to more resilience and the capacity to do more. This is a good time to work with a teacher or trainer who understands how to load the body in different positions. This is also a good time to develop more mindfulness when it comes to movements, rather than pushing ourselves to the limit. An isometric contraction is when we contract a part of the body without changing the joint angle, similar to the static holds we find in yoga poses. Isometric holds are a great way to change the way we contract certain muscles, as well as the way we actually feel and embody these muscles and body parts. For example, if I can’t feel a part of the body very well I probably won’t be able to move it very well. A great place to begin is holding a joint or joints in a static position while adding load and contracting the tissues in that position. An eccentric contraction is when a muscle is contracting and lengthening at the same time. Eccentric movements are a nice way to train our bodies to lengthen and strengthen simultaneously, a piece that is often lacking in yoga education, where the emphasis is often on relaxing into positions. Our bodies are naturally stronger through the eccentric range, and in strength training we can take advantage of this and load them. As an example, both types of contractions can actually be done in chair pose. Chair pose can be done as an isometric hold to build up muscle and tissue activation in the legs (especially in the quads and glutes), which is helpful if those tissues feel weak. We can also work with chair pose in the context of an eccentric and concentric contraction: assuming the pose, focusing on contracting the muscles of the legs, and then sitting down lower (which brings the legs into a deeper range), then standing back up again. The third and final point is hugely important to address before proceeding with more advanced strength work. It’s the idea of joint preparation. Because our bodies only adapt to what we do most often, if we haven’t been moving our joints through certain ranges under load, we should definitely do so—but very carefully. Training our joints to move into awkward ranges of motion can help them grow stronger and ready for the real world (where we frequently move out of our “perfect alignment”). If, for example, our wrists are sore in push-ups, we need to prepare the joints to be able to bear load comfortably. Then, over time, we can progressively do more. An example of preparing the wrists for both yoga and daily life is simply placing the hands on the floor while in a table position. From there place the tops of the hands down on the floor with the palms turned up, and feel how different this position feels. Gradually we want to place all the different surfaces of the hand on the floor and load them gently, but progressively, over weeks and months. Over time, the wrists will become stronger and more resilient in various positions. As the positions begin to feel stronger we can lean more weight into them while practicing the exercise. This is one way to use progressive loading. Not only will it help us to become stronger in our planks, it can help prevent injuries from falling or moving household objects. All this is to say that practicing exercises to prepare our joints prior to further strength training is a great place to start. It also provides a great warm-up, and an exploration of where our joints like or don’t like to go. There are so many reasons for the modern day yogi to practice strength training. Strength practices can help us even out imbalances, which will make poses feel more efficient. And as we move into our later years, we will all want and need more strength. Strength helps us to maintain our tissues, our bones, our movements, and our confidence. As we move into a strength-training practice, we don’t have to just go through the motions until we feel our hearts pounding and the sweat is dripping. It is possible to gain strength in a more gentle and mindful way, with more to consider than we’re sometimes led to believe.